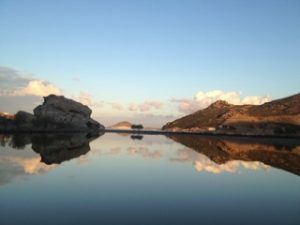 Arriving on Patmos for the first time, people often experience a feeling of ‘coming home’ overwhelmed by the beauty and the quiet spiritual atmosphere of the island. I arrived here five years ago and followed my heart’s calling to settle in this small and remote island where only 3000 inhabitants live all year round. Patmos is known through Greece as a holy island. Saint John, the beloved disciple of Jesus is believed to have been exiled here and heard the voice of God in a cave. He received the visions described in the text of Revelation which forms the last book of the Bible. Even in the antiquity, Patmos was already revered as a holy place since it was dedicated to the Goddess Artemis and two acropolis existed then on hill tops – on one of them is now built the monastery of Saint John and the site of the other can be found hidden away from the touristic path, in the middle of nature. Patmos is an ideal place for connecting with our Angelic guides as the Archangel Michael’s line crosses the island from East to West (see map). I will share with you my experience of angel connections and will guide you, each day with channelled meditations and visualisations whilst connecting with the powerful energy points of the island. We will focus on the significance of the 72 names, facets of the divine and more particularly on the eight sacred names which are linked to the energy and mission of the Archangel Michael. The small number of participants will allow us to create a safe space for sharing and to build some flexibility in the programme. There will be opportunity for individual sessions. The aim of the week is for you to feel empowered to connect with more confidence with your angelic guides. which includes: seven nights in the hotel in shared double rooms, breakfasts, all lunches, the dinner on the first day, the last dinner before departure, the daily seminars, the guided visits, tickets to sites, and transport with two hired cars. Not included : the trip to and from Patmos, your insurance, 5 dinners and the drinks. you are more focused on the now – the only space which enables change. Our daily seminars will last approximately 2 to 2.5 hours. and the symbolism from the sacred archetypes of the zodiac, the Tree of Life and the Wheel of Life. We may decide on some period in the week to remain in silence to help integrate the experience. There is no airport on Patmos. The most common way to travel to Patmos is by flying to Athens and then take a ferry from Piraeus, the port of Athens. The crossing lasts approximately 9 hrs. Usually on Tuesdays the ferry leaves around 3pm, leaving you the time to reach Athens with a morning flight, allowing about 1h30 for the transfer from the airport to the port by taxi. There is also the possibility to take the bus (x96) or the metro. Alternatively, you may want to travel to a nearby island which has an international airpot like Kos or Samos and then the crossing will be much shorter (about 3 hours). The lunches and the two dinners which are included in the programme will be vegetarian – with the possibility of adding some fish dishes. The aim of this retreat week is to help create a scared personal inner-space. We will be able to use an ancient chapel adjacent to our hotel, for some time of personal recollection. Others may prefer to meditate or take some time in nature. This will help us be in the present and to feel an inner harmony. This week is about escaping from our daily life occupations to listen to our inner space. The first step is to say ‘yes’ to ourselves and to allow our Higher self to be heard. An opportunity to open our heart, simply by being, and sharing with each other, allowing the magic of Patmos to operate. Please contact Haniel Sofia Rivière : haniel.sofia@me.com to get an application form.